A Chinese meta-analysis study reveals that abortion results in a 44% increase of risk of breast cancer. Dr. Joel Brind, president of the Breast Cancer Prevention Institute, is the leading authority on the link between abortion and breast cancer. His report Early Reproductive Events and Breast Cancer: A Minority Report was published in response to the National Cancer Institute’s report claiming no connection between abortion and breast cancer. Chapter 24 in Dr. John C. Willke’s book Abortion Questions and Answers: Love Them Both addresses the link between abortion and breast cancer. Read the chapter. Brita Stream, Miss Oregon of the 2002 Miss America Pageant, introduces three young women whose lives were forever changed after they developed breast cancer following their abortions. The information on this video will empower women to make informed choices for themselves and their children. Women at increased risk for breast cancer after abortion will learn about life saving screening mammograms which can increase survival if breast cancer should develop. Length: 26 minutes. 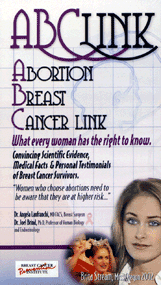 Read The Deadly After-Effect of Abortion: Breast Cancer, by John C. Willke, MD. This entry was posted in Abortion & Cancer by Various. Bookmark the permalink.